For industrial or commercial companies and municipalities that use water towers, cooling systems, or filtering systems, scale (along with pollutants like algae, heavy metals, debris, etc.) can cause problems for the system and destroy its efficiency. TowerKlean LLC searched out a scale-reducing media to make its cooling water-processing equipment work better for their customers. TowerKlean’s primary customer base includes industrial plastic-injection molding companies that use water-cooling towers to supply water used for cooling molds in the injection molding process. But other customers such as municipalities and a host of many others also purchase the equipment for treating water. The system was actually developed by a company called Innovative Water Technologies in 1995. “I’m a manufacturers’ representative. For six years we were the Michigan sales agency for Innovative Water Technologies (IWT) and were very successful in selling this product line,” added Manvel. IWT was in the high-volume water-treatment systems business. They discovered a process media solution produced by KDF Fluid Treatment, Inc. and realized it was a great application for water tower treatment. As water evaporates, the dissolved minerals will concentrate. These minerals and contaminants will eventually reach a concentration where they will precipitate as scale and interfere with the performance of both the tower and the cooling system itself. Typically, chemicals were added to the water to inhibit the formation of scale, control algae and bacterial, and provide corrosion protection. KDF Process Media eliminates the need for any chemicals. “Basically, with the reaction of the KDF media , we are able to modify the crystal structure of the scale compound (calcium carbonate), changing it from calcite to aragonite,” remarked Manvel. “In this modified form, aragonite is suspended in the water until removed by the filter. As the filter backwashes, the scale is literally flushed down the drain. To turn the scale into aragonite and eliminate it, IWT developed a patented fluidized bed using a column of water concept, which is the heart of the TowerKlean Cooling Water Treatment System along with the KDF 55 media . This column allows water to flow up through it, and fluidizes the media. An important feature of this up-flow design is the graduated two diameter clear column where the lower pipe is smaller in diameter than the top pipe. When the water travels upward, the upper and wider pipe reduces the velocity and pressure of the water and allows the media to fluidize. It’s also a self-regulating design that won’t allow the media to migrate out of the column chamber. “Without fluidizing this media, our system would work for about a week, then scale would form in the reaction column and turn it into cement. Also the KDF media typically only needs changing once a year, helping keep maintenance costs down,” said Karen Manvel. Manvel added, “It eliminates virtually all chemical treatments. Most of the other systems out there do part of the job, but not all of it. But you have to have several different devices to take care of corrosion inhibiting, scale removal, and biological treatment. These are basically three areas that you have to have separate systems for, but TowerKlean takes care of all of them. A strainer is the first part of the TowerKlean system, which filters out any large debris. Next, a filter is used that has a single grade of sand to remove smaller debris, silt and turbidity. The following step includes one or more graduated columns, depending on water volume, containing the KDF media . Water is cycled through the system on a by-pass design, where only a certain percentage of its capacity goes through the treatment system. Unlike systems that treat only the cooling tower’s make-up water, this system is integrated to treat the actual water already in the loop. For certain flow rates, the treatment systems are skid mounted and package designed. More than one system can be installed if the flow rate exceeds the capacity that one system can generate. 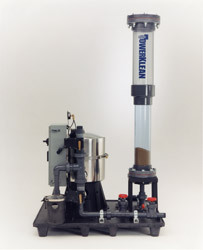 Currently, TowerKlean system has several different filtration system sizes that have one to eight columns. The largest size will go up to a 12,000-gallon total capacity of the system. Systems are sized so the entire volume of water is exposed to the media every 90 minutes.